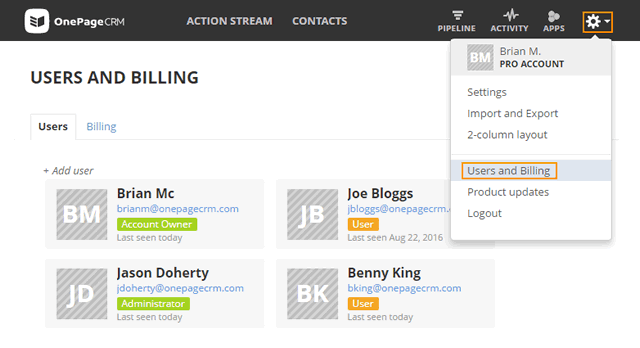 How to cancel your OnePageCRM subscription? 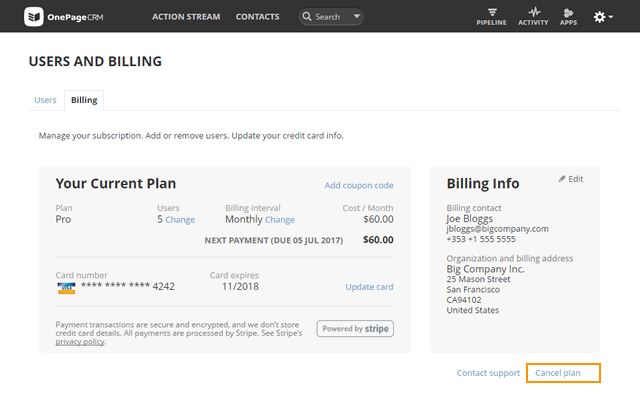 Under Billing, click on the Cancel plan link just below the Billing Info section. In the Cancel plan pop-up, enter your password to cancel your subscription and click on Cancel plan button. Your OnePageCRM plan will be canceled at the end of your billing cycle. What happens to my data after canceling? If you cancel your OnePageCRM plan, after 30 days your account including your data will be automatically deleted. We would recommend you export your data, by logging in within 30 days of canceling and export your contacts and deals from OnePageCRM. The cancellation can be reverted at anytime before the end of billing cycle. For more information click here.